Establish a Plan for Date of Discharge. Plan this day weeks ahead of time. Have a handy checklist of everything you mean to discuss with the doctor and any other reminders so that you don’t forget to mention them. Prepare Your Home. This might involve a conversation with your patient’s current medical professionals to discuss necessary modifications to your home. For example, you might need a hospital bed or a ramp. Part of preparing your home also means making it safe. Remove any rugs or cords that might cause your patient to fall. Remove clutter from your home to allow him or her to move around with ease. Communication is Essential. Open and honest communication between all parties is critical as it is the foundation of a successful transition. Those who are taking on the role of caregiver must be prepared to have conversations with their patient and also medical professionals. For example, is the patient ready to leave the hospital? Do you understand their medication and are aware of its side effects? 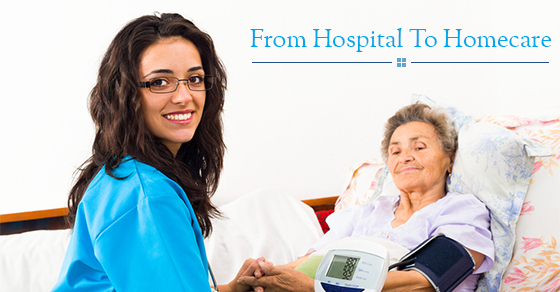 Do you know how to use the medical equipment your patient might need? Again, take notes and do not be afraid to ask questions. Communication is essential when you consider that one out of every 12 patients is forced to be readmitted to the hospital due to breakdowns in communication. Collaboration is Key. New caregivers should not take everything on themselves – this can only lead to physical and mental exhaustion and possibly even caregiver burnout. Invest some time in getting to know key people who will be involved in your patient’s care, including his or her doctors, pharmacists and employees who offer meal services. Make a list of these contacts and keep it in an easily accessible location, such as on the front of the fridge. Do Not Be Afraid to Bring in Additional Aids. Caregiving, although rewarding, can have its challenges. Sometimes, it can relieve a lot of burden by bringing in additional care from outside. It will be beneficial for all involved. In short, do not be afraid to ask for help. If you or someone you know is concerned about how they will be cared for as they age, know that long-term, high quality, affordable and personalized care is available. Contact C-Care today for more.